Please keep in mind that this information is not meant to scare you but to be truthful and honest about all reports related to all hedgehogs and not just African Pygmy Hedgehogs breed in captivity. Reports of illness from breeders in the United State are actually fairly rare. The best way to prevent disease transmission is to WASH YOUR HANDS and to be sure you are not carrying any disease prior to holding your hedgehog. 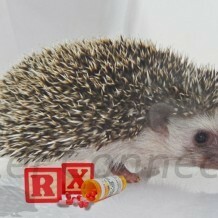 Example: If you have MRSA, then it would be best to avoid handling the hedgehog until the infection passes.